We have abundant reason to rejoice that in this Land the light of truth and reason has triumphed over the power of bigotry and superstition ... In this enlightened Age and in this Land of equal liberty it is our boast, that a man's religious tenets will not forfeit the protection of the Laws, nor deprive him of the right of attaining and holding the highest Offices that are known in the United States. Believing that religion is a matter which lies solely between man and his God, that he owes account to none other for his faith or his worship, that the legitimate powers of government reach actions only, and not opinions, I contemplate with sovereign reverence that act of the whole American people which declared that their Legislature should "make no law respecting an establishment of religion, or prohibiting the free exercise thereof," thus building a wall of separation between Church and State. Who does not see that the same authority, which can establish Christianity, in exclusion of all other religions, may establish with the same ease any particular sect of Christians, in exclusion of all other sects? At a National Flag Conference in 1924, the leadership of the American Legion and the Daughters of the American Revolution changed the words "my Flag" to "the Flag of the United States of America." "I pledge allegiance to the flag of the United States of America, and to the Republic for which it stands; one nation under God, indivisible, with liberty and justice for all." Thus, a secular and all-inclusive Pledge was replaced by a religious and exclusive Pledge, dividing the "indivisible" and not providing "justice for all." On July 4, 1776, John Adams, Benjamin Franklin, and Thomas Jefferson were appointed by Congress to prepare a design for the Great Seal of the United States. Although this first design was rejected, the motto it contained-"E Pluribus Unum"-was retained in the final design that was approved in 1782. As a result, "E Pluribus Unum" (Out of Many, One) became our de facto National Motto. During the Civil War Era, eleven Protestant denominations began a campaign to add references to God to the U.S. Constitution and other federal documents. Their efforts resulted in the phrase "In God We Trust" being added to some Union coins. Later, President Theodore Roosevelt expressed his disapproval, writing: "...it seems to me eminently unwise to cheapen such a motto by use on coins, just as it would be to cheapen it by use on postage stamps, or in advertisements." He thought it came "dangerously close to sacrilege." In 1956, again during the McCarthy era and Cold War "red scare" of communism, Congress passed a joint resolution making "In God We Trust" our National Motto. 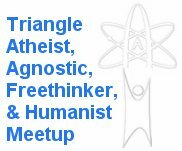 In the last election, Cecil Bothwell, a duly elected Asheville City Councilman, had his right to hold office challenged because of the N.C. Constitution's religious restriction against anyone that doesn't believe in a monotheistic God. North Carolina has had three Constitutions in its history: the Constitution of 1776, the Constitution of 1868, and the Constitution of 1971. Each constitution after the first has carried over--or modified--some aspects of earlier constitutions, but all have included some religious restriction to hold state office. Initially, any non-Protestant was excluded from office. This was later modified to excluding any non-Christian. The current N.C. Constitution excludes anyone that doesn't believe in a monotheistic God. While the trend seems to be toward increased inclusion, it remains in conflict with the U.S. Constitution. United States Constitution prohibits the use of any religious test for Federal office. In 1868, the Fourteenth Amendment extended this prohibition to the States. In 1961, the United States Supreme Court ruled unanimously that such restrictions constituted a religious test incompatible with First and Fourteenth Amendment protections (see: Torcaso v. Watkins) and are therefore unenforceable. Nevertheless, North Carolina (and six other states: Maryland, Massachusetts, Pennsylvania, South Carolina, Tennessee, and Texas) retain restrictive religious requirements in their Bill of Rights, Declaration of Rights, or in their constitutions). In North Carolina, this requirement can be found in the body of the state constitution (see: Article VI, Sec. 8. Disqualification for office), which disqualifies "any person who shall deny the being of Almighty God." This is listed first, even above anyone convicted of a felony or anyone who has committed treason. In 1791, the Bill of Rights was adopted as the first 10 Amendments to the Constitution (The First Amendment reads in part: "Congress shall make no law respecting an establishment of religion, or prohibiting the free exercise thereof..."). In 1797 the Treaty of Tripoli was ratified (Article 11 of the Treaty reads in part: "...the Government of the United States of America is not, in any sense, founded on the Christian religion..."). Article VI, Sect.2 of the Constitution states that "all treaties made, or which shall be made, under the authority of the United States, shall be the supreme law of the land." The Treaty was ratified unanimously and the full text was published in The Philadelphia Gazette on June 17th, 1797, without any record of any public objection. 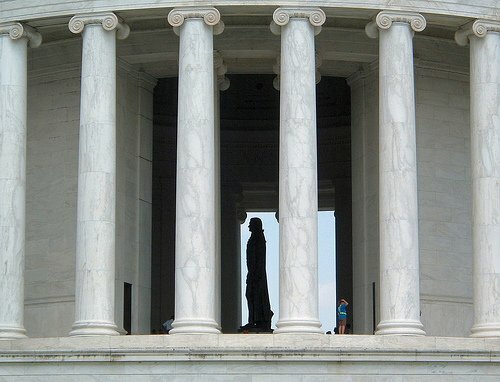 Thomas Jefferson, author of the Declaration of Independence and the Bill for Establishing Religious Freedom in Virginia (which the First Amendment is partially based), wrote that the First Amendment erected a "wall of separation between church and state." "Because religious belief, or non-belief, is such an important part of every person's life, freedom of religion affects every individual. State churches that use government power to support themselves and force their views on persons of other faiths undermine all our civil rights. Moreover, state support of the church tends to make the clergy unresponsive to the people and leads to corruption within religion. Erecting the 'wall of separation between church and state,' therefore, is absolutely essential in a free society." James Madison, sometimes called the "Father of the Constitution," explained that by doing this they hoped to "keep forever from these shores the ceaseless strife that has soaked the soil of Europe in blood for centuries." Madison, who was also primarily responsible for pushing the Bill of Rights through Congress, expressed his interpretation of the First Amendment as a "perfect" separation - between Church and State, commenting that: "The civil government ... functions with complete success ... by the total separation of the Church from the State," and "I have no doubt that every new example will succeed, as every past one has done, in shewing that religion & Govt will both exist in greater purity, the less they are mixed together." "Strongly guarded as is the separation between Religion and Government in the Constitution of the United States, the danger of encroachment by Ecclesiastical Bodies, may be illustrated by precedents already furnished in their short history." Our former de facto national motto, "E Pluribus Unum (Out of Many, One)" is superseded by "In God We Trust"
Starting in 2000, Michael Newdow has filed several lawsuits over the past decade attempting to reverse violations of the Establishment Clause through: the insertion of "under God" in the Pledge, establishing "In God We Trust" as our national motto, and Chief Justices adding the phrase, "so help me God" when administering the presidential oath of office. He won a short-lived victory on June 26, 2002 in his first suit challenging the Pledge when the Ninth Circuit Court ruled that the Pledge was unconstitutional, but lost on an appeal to the Supreme Court when the decision of Ninth Circuit was reversed on standing grounds. His second suit challenging the Pledge reached the Ninth Circuit Court once again, but this time they reversed their earlier ruling and decided the Pledge did not to violate the Establishment Clause. Michael has filed a third suit challenging the Pledge in a different District Court, a challenge to "In God We Trust," and a challenge to Chief Justices adding the phase "so help me God" when administering the presidential oath of office. The first two of these suits are still proceeding, the last ended on an appeal when the appellate panel ruled 2-1 that the Plaintiffs did not have standing due to a lack of redressability.